Star Trek is dead. Just don't tell any Star Trek fans that. With on going talks about the next film, us long time fans have high hopes that the franchise can be renewed with the kind of passion that the Bond franchise was reinvigorated this last year. With J.J. Abrams scheduled to helm Star Trek XI at this point, and with a release date perhaps as early as Christmas of '08, Kirk and company could once again be all the rage. Diamond Select Toys continue to bring us the action figures based on the various shows and films. The latest release includes everybody's favorite android, Data, the visually challenged Laforge, and the pasty white guy Barclay. These are all in season 7 garb, with appropriate accessories. I'm reviewing these three tonight, but also in this Series 3 is the "All Good Things" Geordi and Data two pack, a Lore figure, and a Nemesis version of Geordi. These should be at retailers now, and should run around $15 a pop. The packaging remains similar to the previous releases. It's colorful, and shows off most of the figure and accessories well, but MOCers are likely to find it difficult to store. The cardboard backer tends to take on more damage than a clamshell as well, but they sure are easier to open up. These are done in a 7" scale, like the rest of the series, but run a bit big (also like the rest of the series). While Data and Barclay stand 7 1/2 inches tall (and both use the identical body), Geordi is just a hair over 7 inches tall, with a different body sculpt entirely. 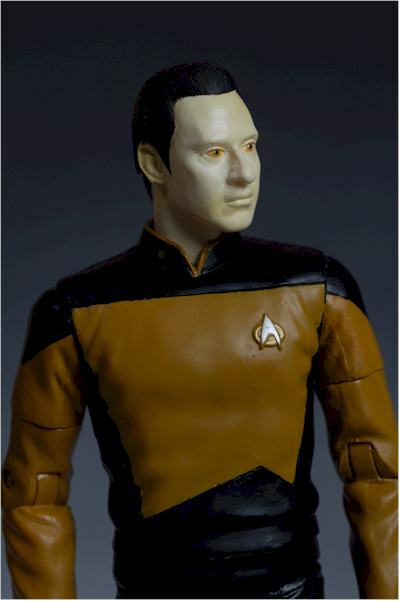 The three head sculpts are all fairly accurate, if not quite as mind blowing as the Riker or Worf. 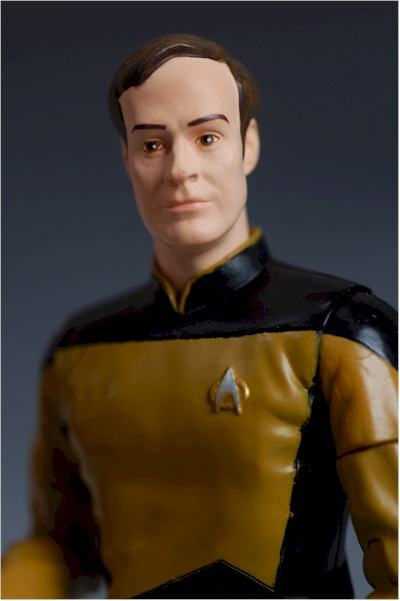 They all stand well on their own, but the sculpted closed left hand on Barclay and Data (again, exact same sculpt below the neck) makes using accessories with both hands impossible. And unless you plan on posing them shaking their fist at those damn kids on the lawn, it's not the most useful look for either. The internal scale and proportions are good on all three, with no bobble heads or pin heads to be seen. 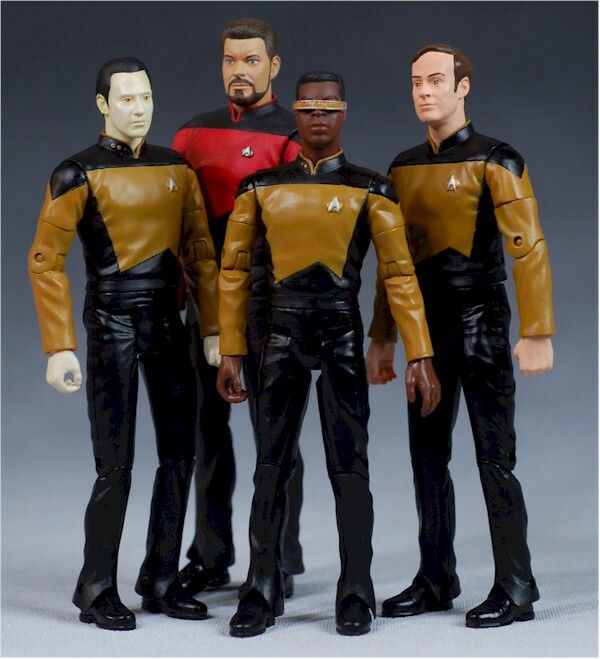 The scale between them (and other figures in the line) isn't bad, although Geordi does seem a smidge small to me. My Geordi also has some issues with his visor, which is glued on a bit sloppily, as well as slightly crooked. The size is good though, with nice texture work on the front. One of the areas that has been impressive with the DST Trek figures is the paint work, but this time there's a little more slop than I expected. 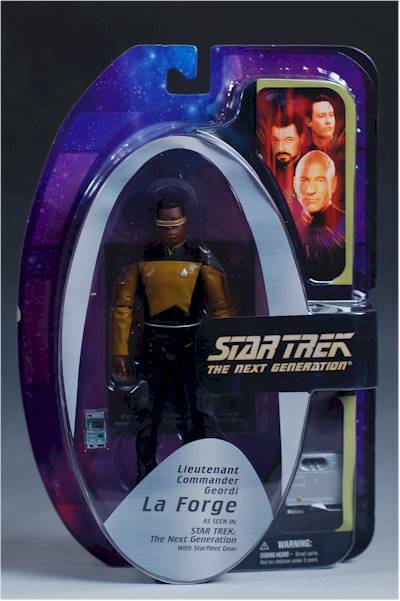 Some of the problem areas are Geordi's visor, the thin edges between colors on the uniform, and even the small insignia. These problems seem to be more of an issue with Geordi and Barclay. Barclay is also very white, which he was...but this time he seems a little too pasty. Data is quite pasty as well, but on this character it's absolutely appropriate. One issue that all three of these figures has that the previous series did not is a glossier paint job on the bodies. Stand these guys next to someone like Worf, and the much shinier paint/plastic is quite evident. These are written up as 20 points of articulation, but you can count them a number of ways. 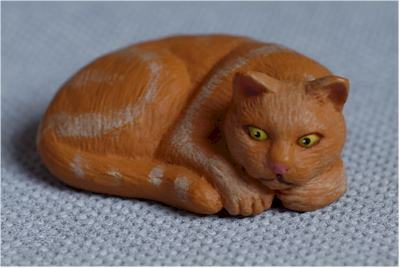 All three have a ball jointed neck at the torso, but the only real movement you'll get is turning it from side to side. If these could tilt a bit, it would go a long way to adding some personality to the poses. They have the rest of the articulation that you've become accustomed to with this line - ball jointed shoulders, cut biceps, pin elbows and knees, cut wrists and waist, pin ankles, and a T crotch. The joints work well enough for some basic posing, especially with the arms. However, Barclay and Data both get a bit of a deduction for their wonky right knees. They turn inward a bit, and it appears that it's either a manufacturing defect, or how the internal tray was formed that they have been held within. Either way, the result is difficulty doing some poses, and an odd tilt to that leg. Laforge and Barclay are both members of the DST school of accessory reuse. They each have a silver case, and a spiffy TNG tricorder. These look quite nice, and can be held in their left hands, but aren't exactly a ton of goodies, especially since they are identical. Data does much better. 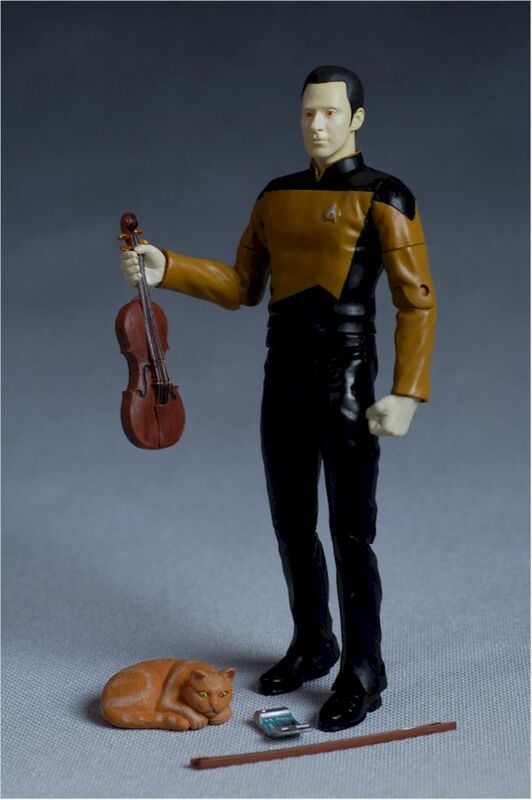 He has the same tricorder, but he also has his cat, all curled up in a ball, and the violin and bow. 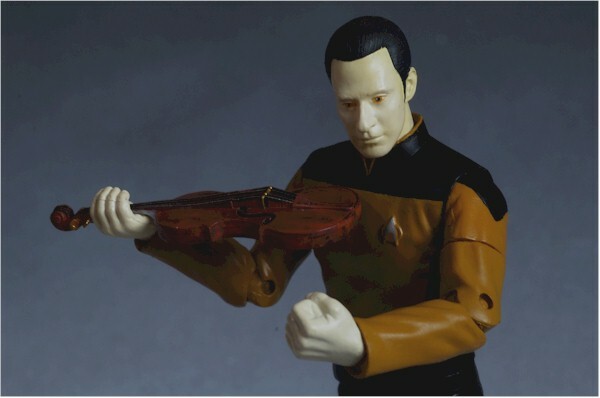 Unfortunately, he can't actually be posed playing the instrument because of the sculpted fist he has for a left hand. But he does have a nice assortment of goodies, with a bit less reuse. The violin does suffer from a very bad paint job on the back of the neck, which is also made from a very soft rubber. 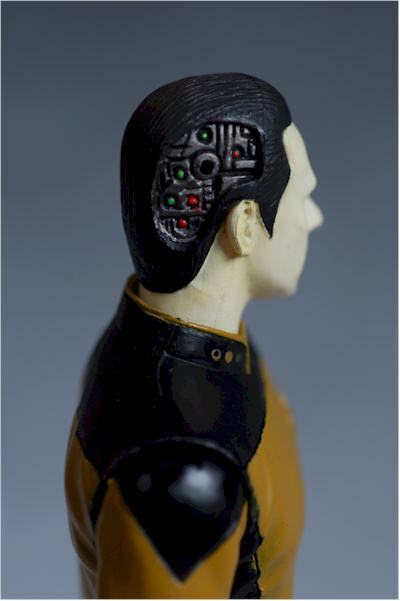 Data also comes with a section of his head which opens up, revealing the underlying circuitry. This is packaged separately in the bubble, but once in place looks quite good. It's a really nice touch to be able to remove it, and they did a great job making it fit almost seamlessly when in place. While none of the series is really designed for kids first, they do have a decent amount of articulation and accessories. They're also a nice, hefty size, and the joints are fairly sturdy. However, while some characters in the series are visually interesting for kids, none of these three is likely to do much for them. If you bought them Barclay, I'm sure they'd be wondering why you were giving them an action figure of their father's insurance agent. I'm judging these at around $15, the suggested retail, which is about $3 too much. Data's not too bad at that price, considering his number of accessories, but the other two are certainly not worth more than $12 each. Unfortunately, with Barclay being the 'chase' figure of this series, it's quite possible that you'll end up paying $20 - $25 for him. 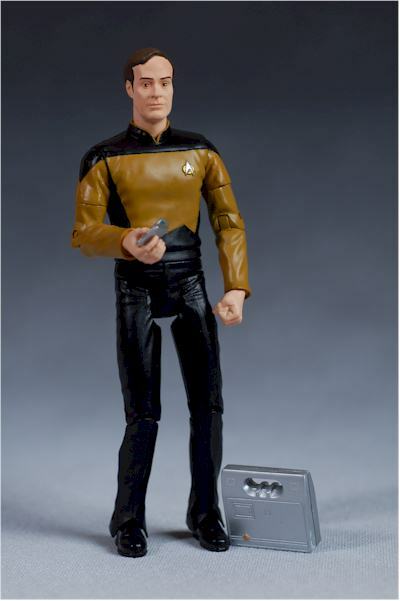 If you're picking them off the shelf, see if you can find a Data or Barclay without the wonky right knee. It looks like either a manufacturing issue, or a packaging issue, but either way they are probably not all this way. Oh, and take lots of care with the violin. That neck is so thin, that it would be pretty easy to tear right off the body. Okay, I admit it - I'm an old school STOS fan all the way. But DST has done some nice work with the TNG line as well, and fans of the show will find plenty to like in series 3. There's a handful of minor issues, but these will look nice on the shelf with the previous two series, provided you can find a Barclay at a reasonable price. 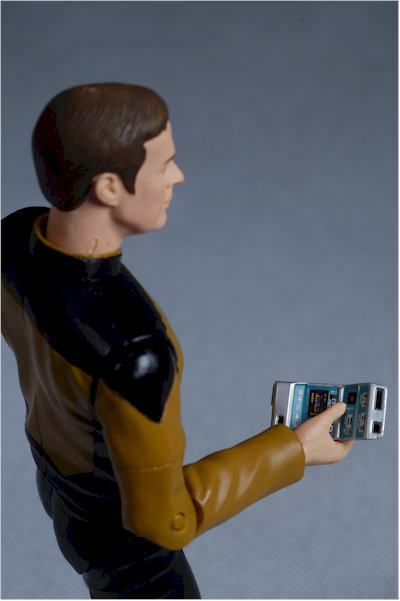 - Amazing Toyz has Data and Geordi together for $23, or singles for $12. - CornerStoreComics has a few of the series 3 figures still in stock for $12, but is selling out fast. 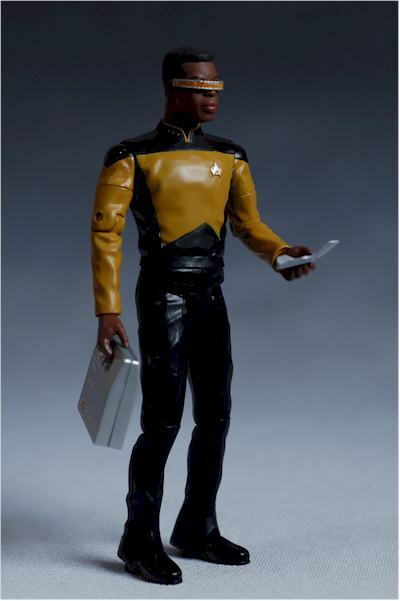 - Alter Ego Comics has the Data and Geordi for $25.49 as a pair. - YouBuyNow has them for $15 each. - the most recent was also from TNG, the Riker and Worf wave.